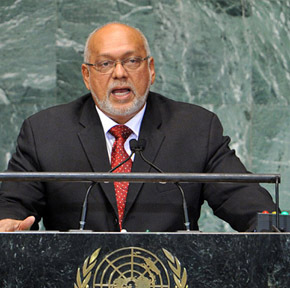 Last week GINA, the Government’s information service, reported that President Donald Ramotar had met Guyanese in Washington and Queens, New York, in the course of his visit to the United Nations, and that he had asked them to return home and invest in the country’s economy. One wonders if he was serious when he put that question to his compatriots in the diaspora, or whether he was just going through the motions. If he was serious, then he is truly divorced from reality; we have been waiting twenty-two years for this flood of returnees to swamp us with their US dollars, their overseas skills and their drive to nurture their homeland, and no one, even President Ramotar one would think, anticipates that they will do so in the immediate future.